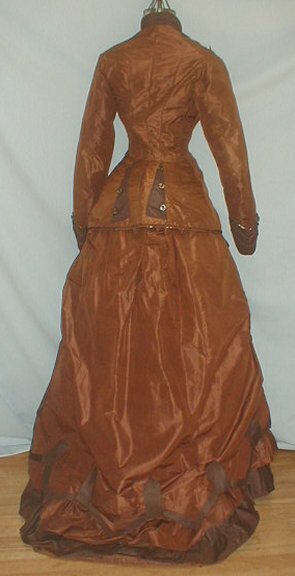 An elegant 1870’s copper and brown silk bustle dress that has recently been de-accessioned from a New York state historical society. The cataloging tags are attached to the dress. 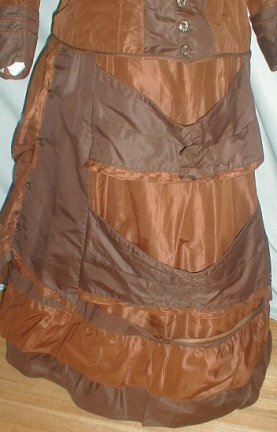 The front of the bodice, collar and sleeve cuffs are made of brown silk. 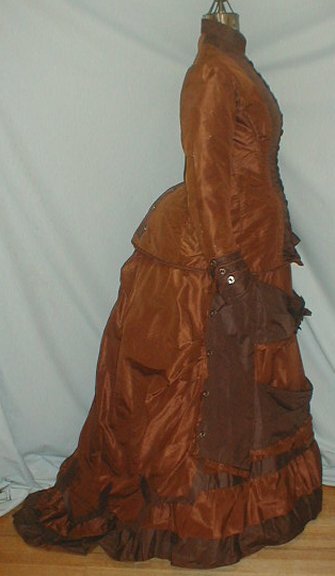 The sleeve cuffs are edged with copper silk and the bodice hemline is edged with brown silk. 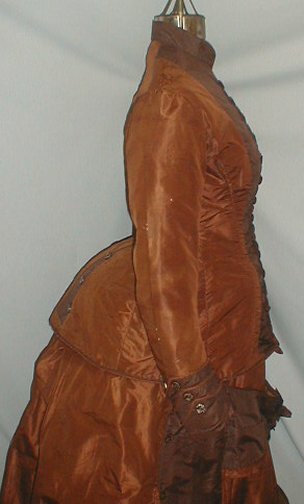 The back of the bodice is trimmed with brown silk. The bodice is lined with cotton and has a front button closure. 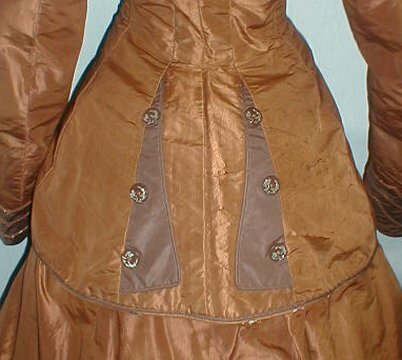 The sleeve cuffs and back of the bodice are trimmed with decorative buttons. The buttons are very beautiful with silver etched flowers on a brown background. 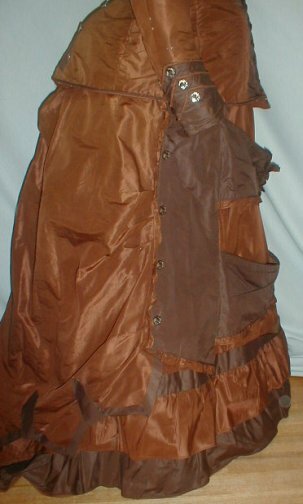 The skirt has pleated and draped front panels and side panels made of brown silk. The side panels are trimmed with decorative buttons. 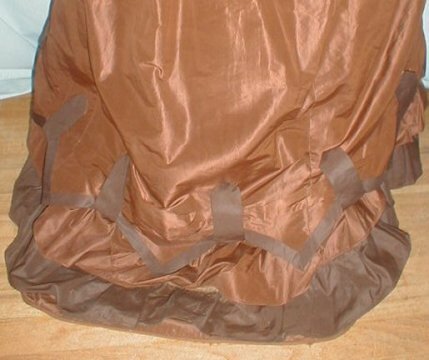 The skirt is parly lined with cotton. The dress is in good condition except for one shoulder area. There is stress splitting in this area and on the very top of the sleeves. There are a few tiny pea size holes in the sleeves and one small 1/8 inch split in the skirt and some mild underarm discoloration. 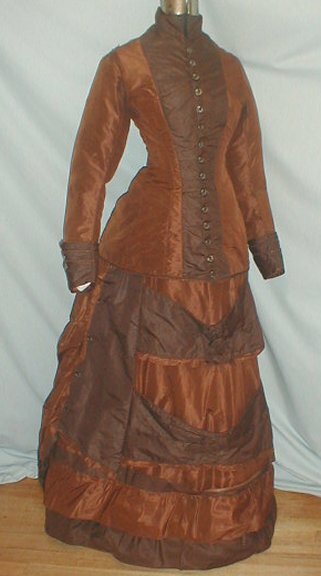 A very lovely display dress. Bust 34 waist 24 Front skirt length 42 back length 49. So...I was doing some searches and realized I missed a lot of ebay auctions of some gorgeous stuff recently. This was one item. I'm going to try and not miss stuff again (because it's a pain to find it again! ).